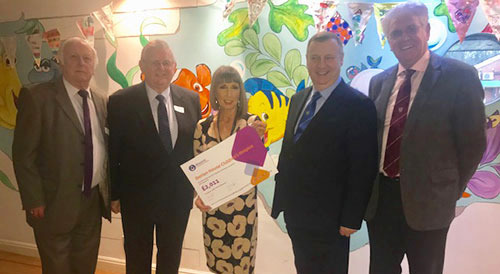 Representatives from the Chorley Group were made very welcome at Derian House Children’s Hospice when they called to mark the award of £2,011 from the Masonic Charitable Foundation. Pictured from left to right, are: Jeff Lucas, Stewart Seddon, Susie Poppitt, Peter Lockett and Malcolm Warren. Assistant Provincial Grand Master Stewart Seddon led the visitors and he was joined by the Chorley Group Chairman Peter Lockett together with Jeff Lucas and Malcolm Warren, two of the local charity stewards. The grant was made by the MCF on behalf of local Freemasons as part of the annual, national award scheme which this year saw a total of over £600,000 provided to hospices countrywide, with those in our own Province receiving £20,732 in core funding alone. Additional sums have already been allocated to hospices who took up the opportunity to bid for project specific funding and an additional £39,439 was shared recently between two successful hospices in the Province. The team were given a guided tour around the hospice and were informed that the donated funds will be used in the neo-natal department, to assist with the care of young babies. Fund Raising Manager, Susie Poppitt, explained that refurbishments were due begin in March this year and work was to be carried out in a number of phases to improve the overall structure of the hospice. Over £500,000 is to be invested in upgrading. At the conclusion of the visit, Susie expressed both her own gratitude and that of the hospice for the continuing vital support that Freemasons provide to Derian House both nationally and locally.